The thumb has a loose joint mechanism that allows it a wide range of mobility. This makes it vulnerable to injury. Due to the close proximity of muscles, ligaments and tendons, identifying a sprain or strain can be difficult. A sprain involves injured ligaments, and a strain refers to injured tendons. Injuries often result from a blow to the tip, crushing trauma, twisting or repetitive movements involved in gripping or using a computer mouse. 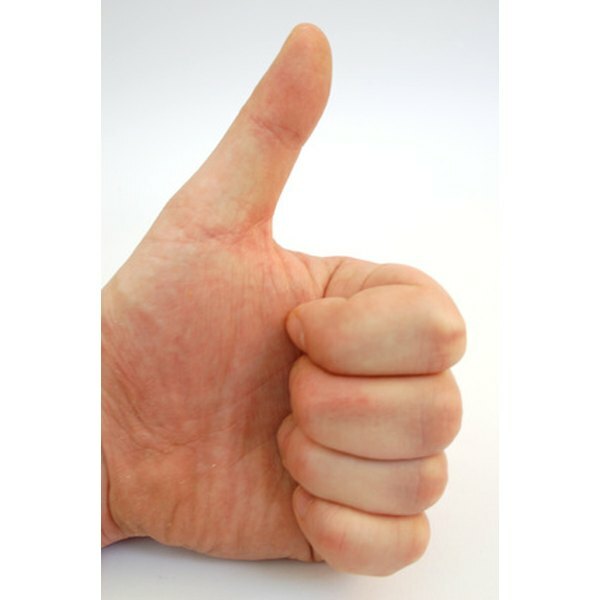 The thumb consists of eight muscles: four within the hand and four connecting from the forearm into the bones of the thumb. This allows for the power of gripping and pinching. Pain at the base of the thumb is the most common symptom that occurs with these activities. As decreased pinch strength occurs, patients may experience a "clicking" or "catching" with various movements due to instability of the joint or a tendon shifting under tension. Repetitive motion disorders defined by the National Institute of Neurological Disorders and Stroke are soft tissue conditions that result from repeated motions performed during work or daily activities. They are caused by too many uninterrupted repetitions of an activity or motion, unnatural or awkward movements. Tendons of the thumb are vulnerable with these disorders, especially with computer mouse activities. Injuries often develop because the tissue being irritated does not have enough recovery time prior to being used again. According to the American Society for Surgery of the Hand, DeQuervain's Tendonitis is a condition developed by irritation or inflammation of the wrist tendons at the base of the thumb. Inflammation causes the compartment consisting of a sheath around the tendon to swell and enlarge, making thumb and wrist movement painful. New mothers are especially susceptible to this due to caring for an infant, often creating awkward hand positioning. Pain may appear either gradually or suddenly. Tendons have a protective sheath of tissue surrounding them. Within this sheath is a lining called the synovium. The synovium produces a lubricant called synovial fluid. With repetitive use or infection, the sheath becomes inflamed, causing tension on the tendon or pain with movement. Tendons recover but if left untreated, they may rupture or permanent damage may result. After an injury, strengthening exercises and proper body mechanics are needed to avoid re-injury. Most injured tendons recover with rest, cold packs and anti-inflammatory medications. Splinting or taping to protect the thumb and supportive tendons may also be necessary. Once swelling, pain and inflammation have resolved, gentle strengthening exercises can be initiated. Always exercise without pain. Returning to repetitive activities needs to be monitored so as not to re-aggravate the tendons. A supportive thumb brace may be needed on an intermittent basis to build up endurance. Gary Maguire has been writing since 1998 and provides medical reviews for Research Review Services. As a physical therapist for 19 years, he has also served as an expert witness, corporate speaker and taught continuing medical education. Maguire holds a Master of Science and a Bachelor of Science in physical therapy from D'Youville College and a Bachelor of Science in biology from Washington State University.